With 1 month to go before the epic Lands-End To John O'Groats (LEJOG) cycle trip, I needed some practice. I'd bought a new road bike 6 weeks before and had ridden a total of 20 miles on it. As much as I loved the bike, I didn't love riding it. Being more of a mountain bike man, the riding position felt all wrong and I just couldn't work out the gears. Today would be 101 miles of getting used to it. Martyn, a fellow LEJOGger, had done a couple of Wiggle Sportives already. The sportives are long-distance cycle one-day events organised by the on-line sports shop. Martyn gave me some good advice a week before that its best to get there and set-off early. The organisers started everyone in groups of 25 and if you get there late you can get stuck waiting for the crowd to start. The event had 3 distance options: "Short" at 50 miles; "Standard" at 76 miles and "Epic" at 101 miles. I chose the Epic mostly because I couldn't understand driving so far for an event and only doing a short version of it. It was on the start line that I realised that everyone else on the Epic was really fit. In most organised events I tend to finish in the middle of the pack, but I had a feeling that I would end up nearer the back. The event was well organised with excellent signage. This was good as I had decided not to take a sat-nave with me. The only tricky bit came around half way when the route crossed with another cycle event that had almost exactly the same direction arrows, just pointing a different way. The big advantage of being slower than nearly everyone else is that getting regularly overtaken was a good sign that I was still on the right route. As a practice ride it all worked out well. The new bike did its job and I had over 8 hours to get used to the riding position and how the gears worked. All but 1 of the LEJOG days will be shorter than this and we'll take more breaks during those rides, so I was feeling pretty confident by the end. My premonition on the start line that I would finish near the end was pretty accurate as the car park was nearly empty by the time I finished. I think that everyone who finished after me either got lost or had a mechanical problem on route. 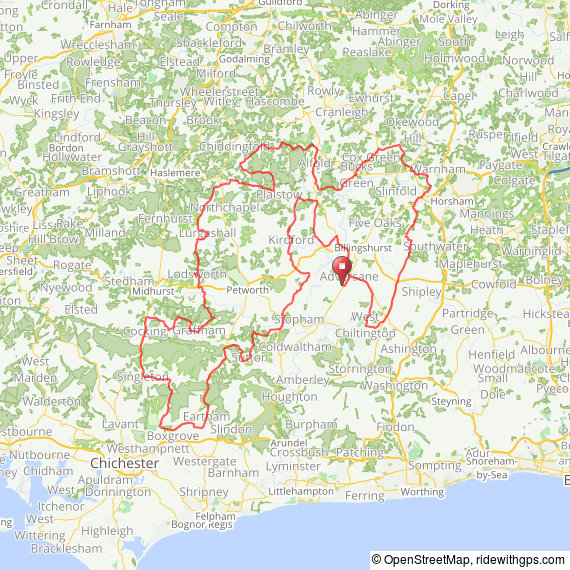 So, my first Wiggle was a success and I'll remember it mostly for the beautiful route through some amazing South Downs villages. I'm sure I'll be back for more Wiggles.